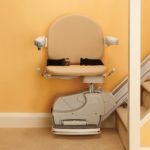 Stair Lifts Atlanta, LLC has provided straight and curved stair lifts for satisfied homeowners across north Georgia since 2014. We offer a complimentary in-home assessment to aid you in choosing a stair lift, and provide you with the stair lift pricing and equipment information you need for a Georgia certified stair lift installation. Straight Stair Lifts require the stair lift user to get in and out of the stair lift. The chair lift runs straight from one floor to the next. 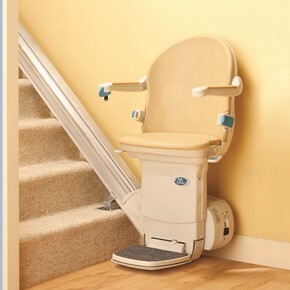 Straight stair lifts are installed within a few days of contacting Stair Lifts Atlanta. 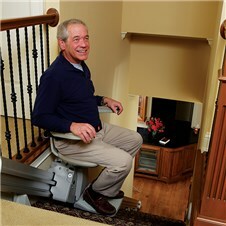 Curved Stair Lifts also require the stair lift user to get in and out of the stair lift chair. It runs up a portion of stairs to a landing, and then up another portion of stairs, from one floor to the next. Curved stair lifts are custom-made to fit the exact dimensions of your stair. Vertical Platform Lifts (VPLs) carry the passenger vertically in their wheelchair or scooter. No transfer from the wheelchair or scooter to a lift seat is required. Inclined Platform Lifts (IPL) carry the passenger in their wheel chair or scooter, vertically on an incline at the same angle as the stair. The inclined platform lift makes stairs accessible for the wheelchair bound individual. Outdoor Stair Lifts and wheelchair lifts are manufactured for outdoor installations; and are located at sidewalk access points between a parking area and a deck, porch or door location. Residential Elevators Stair Lifts Atlanta offers the assistance you need to make an informed decision about a residential elevator and provides installation and inspection by individuals who are certified by the State of Georgia. Stair lifts travel on tracks entirely supported on the treads of the stair. Powered from rechargeable batteries and direct current, chair lifts are able to continue functioning during a power outage. 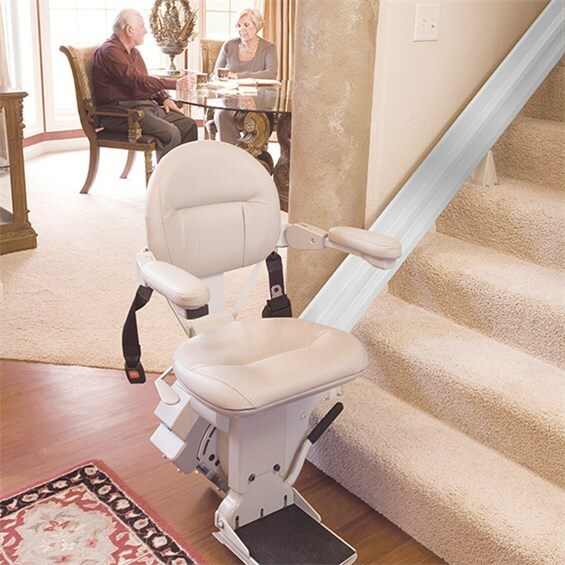 When not in use, the chair lift folds up to a narrow profile, opening up the stairway. 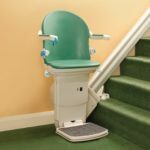 For clear guidelines on stair lift selection please read the three-part analysis on “How to Select a Stair Lift”. Visit the “Straight or Curved Stair Lift?“ page for information about how to choose between these two options, and for other tips for choosing a stair lift. Every lift installation and inspection is performed by technicians certified by the State of Georgia, offering professional home lift installation, maintenance and repair. 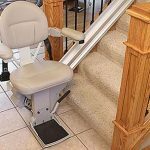 The state certified lift installer conducts a free in-home assessment to measure the lift area, and provide you with stair lift pricing, availability and warranty information. For testimonials about Stair Lifts Atlanta, LLC, visit our About Us page. 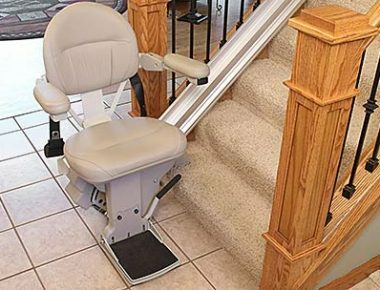 Contact Stair Lifts Atlanta, LLC by telephone at (770) 880-3405 and we will assist you in the choice and installation of a stair lift that is exactly suited to meet your mobility needs. Or, you may enter your information in our online contact form, and we will call you! Elizabeth Greenewald, CAPS, owner of Stair Lifts Atlanta, LLC, combines her architectural design expertise with her personal desire to assist seniors and people with disabilities as they seek to overcome home mobility and accessibility challenges. Elizabeth has received the Certified Aging in Place Specialist (CAPS) designation from the NAHB. Previously registered as an architect in Pennsylvania, Elizabeth earned her Bachelor of Architecture and Bachelor of Science in Architecture degrees at Kent State University in Ohio. Barrow County, Cherokee County, Clayton County, Cobb County, Coweta County, DeKalb County, Douglas County, Fayette County, Forsyth County, Fulton County, Gwinnett County, Hall County, Henry County, Jackson County, Newton County, Rockdale County, and Whitfield County.